The first step in the purchasing process of pro sports apparel was to create an account at the website under the tab ‘My Account’ where users can then manage their profile and shopping cart while tracking orders. Once this was done I surfed through the site in order to find the right deal for me. I wanted the Richard Sherman Seattle Seahawks NFL jersey but at $149, it was out of my credit limit and budget. 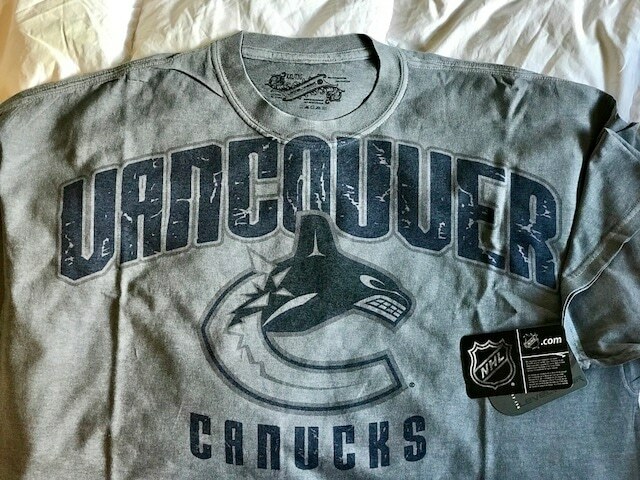 I settled on a XXL Los Angeles Dodgers jersey from Majestic and a Vancouver Canucks t-shirt made by Levelwear. 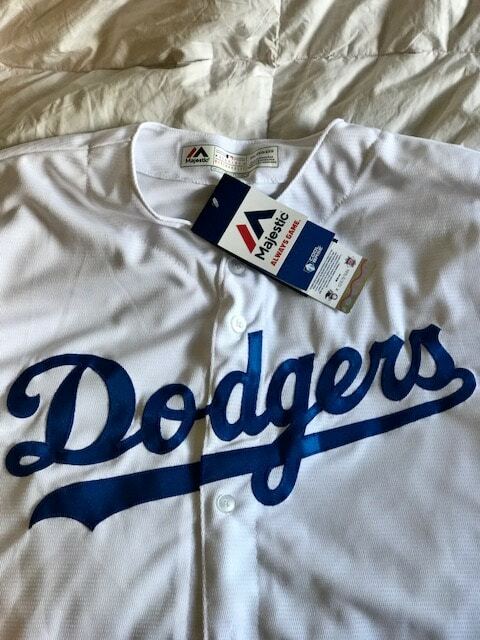 After picking the Dodgers jersey I noticed Levelwear had items on sale at 50 percent off. My first NHL choice was the Montreal Canadians because as a kid growing up in Michigan during the early 1970’s they were my favorite team led by Hall of Fame players Ken Dryden, Guy Lafleur and Larry Robinson. Unfortunately, the shirts I searched and found did not have any XXL sizes left at my price point. Next, I perused the Detroit RedWings swag because my Dad hails from the Motor City. Same issue happened again, the apparel I was interested in with the budget I had left over did not have the correct size for me. I decided to look at one more hockey team, the Vancouver Canucks because growing up in Seattle with many a friend in British Columbia; I wanted to support the local team next to Washington state. To my luck and timing, the only choice they had available in the t-shirt I wanted was XXL making it a done deal. As for the currency – IceJerseys accepts both CAD and USD for all purchases – you can toggle the currency of your choice by selecting the American or Canadian flag from the website header. There should be no issues with converting currencies if you choose to pay USD for a CAD purchase. I called customer service because I ordered the Dodgers jersey and Canucks Tee on two separate orders and wanted to see if they could add them together as one package, saving me the extra shipping fee. This was no problem at all. The IT person I talked with next let me know that the system they use has technologies that tracks and ships hundreds of orders per day. I waited for the two-day shipping package to reach me in Atlanta and was easily able to track the USPS delivery date through both my iPhone and laptop. I was excited when it all arrived on time as the Sports Techie YouTube video shows. IceJerseys.com has a compelling history according to the company that “dates back to a time when the Commodore 64 was the best-selling computer in the world”. The internet was not quite proven tech for businesses to use back then. The founder’s mission has always been to offer the best selection of officially licensed sports merchandise dating back to when their small sports store, ‘Sport Buff’, was first operational across the street from the fabled Montreal Forum. The company ventured into online retail NHLHockeyJerseys.com in 1999. The site morphed into IceJerseys.com in 2002 using emerging technologies and the same dedication to fans and customer service to become a global player in online sports retailing. They currently offer a growing selection of both MLB and NFL merchandise to complement their NHL product lineup. Overall, it was a seamless fan experience thanks to IceJerseys.com and their up-to-date shopping technology. Sports Techie, MLB postseason is nearing and the Dodgers are a shoe-in to make it as they continue on a historical season. I cannot wait to wear the first MLB jersey I have owned in support of my favorite National League team since I was a kid pretending to be Steve Garvey, Davey Lopes, Ron Cey, and Dusty Baker, in our backyard playing whiffle ball with my family and friends. Perhaps the Canucks will get back to the NHL playoffs for the upcoming 2017/18 season in hopes of a Stanley Cup appearance even though the road goes through the Pittsburgh Penguins. When that happens I will proudly represent the sport and team from Georgia. Go Blue all the way to a World Series win!